The other two officers killed have been identified as Matthew Gerald, a 41-year-old former Marine and father of two daughters, and Brad Garafola, 45, the Advocate reports. Gerald joined the force earlier this year and started doing solo patrols less than two weeks ago. Kedrick Pitts, Jackson's brother, tells NPR that his brother would have wanted people to "put a end to all this madness." "He just asks everyone to respect everyone, continue to love everyone and he wanted everyone to get through this together. He didn't want any hatred going on, especially killing, you know. He was a police officer. He wanted peace," Pitts says. The shooter, who was killed at the scene, has been identified as Gavin Long of Kansas City, Mo. The former Marine, using the alias "Cosmo Setepenra" made numerous online posting complaining about how black people were treated by police, the Guardian reports. He described the July 7 killing of five Dallas police officers as "justice," and apparently visited the city a few days after the shooting. The Marines have confirmed that Long, 29, received an honorable discharge in 2011 after five years in which he rose to the rank of sergeant and served in Iraq for a year. In the years after leaving the military, Long apparently traveled extensively in Africa. 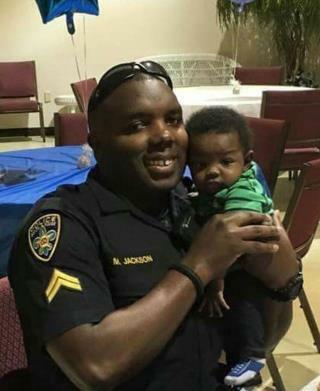 Quinyetta McMillon, the mother of one of Alton Sterling's sons, condemned the shooting of the Baton Rouge officers, CNN reports. "We reject violence of any kind directed at members of law enforcement or citizens," she said in a statement. "My hope is that one day soon we can come together and find solutions to the very important issues facing our nation rather than continuing to hurt one another." Our pouts is getting what he wants! Marshall law!!! "Quinyetta McMillon, the mother of one of Alton Sterling's sons" Exactly how many "mothers" are there? Heartbreaking. Sadly, not surprising as BLM has been calling for this since day one. We've have hours of video footage of them calling for dead cops.